Here's a little fundraising inspiration from the football field. "Little things make the difference. Everyone is well prepared in the big things, but only the winners perfect the little things." That quote comes from Bear Bryant, the legendary football coach from the University of Alabama. Alabama's football team is legendary, too. The Crimson Tide has won the most national football championships of any school in NCAA history. What does this have to do with fundraising, you ask? 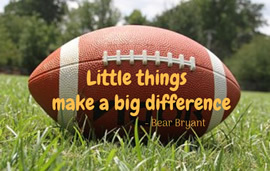 Remember what Bear Bryant said: "Little things make the difference." That's true in fundraising, too. Take, for example, your fundraising appeal letter. There are plenty of best practices to follow. They include effective storytelling and keeping your message simple. Within each of those best practices are a number of "little things" that you can put in place to make your appeal stand out from the crowd. In fact, I encourage you to check your fundraising appeal against this list before you drop your letters in the mail. These are simple things that will only take you a minute or two to implement. I promise. Here's a simple trick: increase your font size in your next letter. It's a scientific fact. Our vision worsens as we age. After age 40, most people start to notice that change. Many start to need reading glasses. And here's the thing. Donors are older than you realize. In fact, most donors are older than 40. A lot older. The simple truth: If your donor struggles to see what you've written, she won't read it. That's true for fundraising appeals, newsletters, and other materials. And here's a corollary: Don't make your reply device so small that it's hard to read and/or fill in. Make it bigger, so it's easier for your donor to complete it. There's a new standard in town. Your nonprofit donor communications should be written in a font size 14. One reason why is because you're most likely writing to an older audience. The jury is out as to how much the font itself matters. Some people believe serif fonts (like Times New Roman and Garamond) are better for print materials, while sans serif fonts (like Arial and Calibri) are better for digital materials. Typographers say these are myths. However, most can agree that not all fonts are created equal. Some (like those listed above) are easier on the eye than others. Whatever font you choose, it's important to use one that's easy for your donor to read. And black type on white paper works best. Need more proof? Consider what donor communications expert Tom Ahern says about fonts and colors. In Keep Your Donors, he says, "Reading is already a form of mental labor. When you make it more laborious through reader-unfriendly typographic choices, people will find other ways to spend their precious time." Again, if your donor doesn't read what you write, she definitely won't respond to it. White space is a wonderful thing. It literally creates space around text and graphics, so your document is less crowded. White space allows your reader's eye to rest, and it increases readability. So create white space at every opportunity. Three easy ways to create white space? Indent your paragraphs. Left flush letters look very business-like. Your appeal letter should look like personal correspondence. So, indent every paragraph, every time. Increase the line spacing in your letter. Most computer programs default to a line spacing of 1.0, which is a little crowded. My word processor has a drop-down option to increase it to 1.15. Try it. It's one of those "little things" that makes a big difference. A 14-point font is the recommended standard for your donor communications. Never ever decrease your font size if you want your material to be read. Bigger is always better. And, the older your audience, the larger the font should be. Did you select a readable font and font color? Times New Roman (black on white paper) is always a safe choice in print communications. You can use a second font for emphasis - and even a little color - but stick to a maximum of two fonts in your appeals. Did you create as much white space as possible? Look for ways to create white space in all of your donor communications. For instance, indent your paragraphs, increase your line spacing, and keep your margins wide. By making little changes like these, you can make a big difference in your presentation. "Little things make the difference....Everyone is well prepared in the big things, but only the winners perfect the little things." While not every college football team can reach Alabama's elite status, every nonprofit can have a winning year-end campaign. Whenever you write an appeal letter, make sure you remember these "little things," too. You can do this! Now, get out there and write a winning appeal! Need help writing a fantastic year-end appeal? Or just want someone to help you turn a good letter into a great one? Laura Rhodes can help.